3 Kittens Needle Arts offers a variety of classes to engage and challenge students at all skill levels, from very beginning to intermediate to advanced. Our classes are designed to build your skills and inspire your creativity. We want you to get the most out of our classes, so all of our class descriptions include prerequisite skills. If you don't have some of the prerequisites, you may want to take a class at a previous level before advancing to the more challenging projects. These 3-hour sessions provide a relaxed, informal atmosphere where you can bring your own project and enjoy the company of others with the guidance of an experienced instructor. 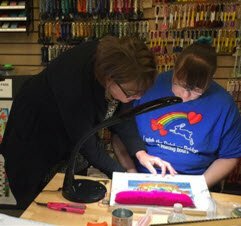 Your instructor can assist you with interpreting a stitch guide, selecting thread, or understanding a complicated technique. Studios are available on Thursday afternoons. Similar to the Studios above, students in our Embellishment Classes bring their own projects; however, the instructor is available in Embellishment Classes to help you develop your own stitch guide for your canvas. She/he may also provide suggestions for ways to add extras (embellishments) to your canvas to make your project even more unique! Embellishment Classes are three hours long and occur on Fridays, Saturdays and Sundays. Our private one-on-one format provides the best opportunity for success; you will learn the basic needlepoint stitch (tent stitch), gain general knowledge of needlepoint, and discover the different thread choices and other important supplies that will enhance your stitching experience. Sessions are by appointment only. We will work with you to schedule a time that fits in your schedule. These single session classes are intended to teach you new techniques that you can use on your own canvases. You will bring a canvas of your choice and the instructor will teach you and your classmates a specific technique. Project classes are canvas specific. Each class will include a stitch guide and detailed instruction on how to do all of the techniques for that canvas. If you are unable to make the class, Home Study options are available (except for fusion classes) - call the store for details. Fusion Classes are special type of project class. You will have several canvases to choose from, and you will participate in the selection of threads and stitches from a variety of suggestions provided by your instructor. Home Study is not available for Fusion Classes. Registration is fast and easy. We can take your registration online, in person, or over the phone. All you need to do to secure your spot in a needlepoint class is to pay the deposit (equal to the canvas price). All other class materials will need to be paid for prior to class. We accept Visa, MasterCard, American Express and Discover as well as cash and checks. If you are registering online, we also accept Paypal. Online registrants will be emailed a confirmation of their place in class. Each class has a maximum of 6 unless otherwise noted. Classes are filled on a first-come, first-served basis. Once you have registered, we will provide you with a Class Information Sheet that lists all of the class materials you will need as well as any class preparation instructions. The specified materials must be used for the project and purchased at 3 Kittens Needle Arts. 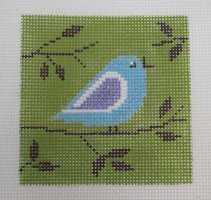 Needlepoint class materials include the canvas, thread kit, embellishments (if required) and stretcher bars. All at least 2 weeks for any special orders for regular stretcher bars; 6 weeks for Evertite bars. We may need to keep your credit card information on file if the price for the thread kit is not available at the time of class registration. Your fiscal safety is important to us. We will keep your credit card information stored securely. 3 Kittens reserves the right to cancel or reschedule a class if the minimum of four students is not attained. If the class is cancelled by 3 Kittens, class fees will be fully refunded in the form of original payment. For needlepoint project classes, student cancellations must be made at least six weeks prior to the first session to receive a refund for the class fee. After that date, class fees are not refundable and cannot be transferred to another class. Any canvas, threads, stretcher bars or supplies purchased for the class are also not refundable. If you must cancel after six weeks, please consider a Home Study option. Call shop for details. For technique classes, student cancellations must be made at least two weeks prior to class to receive a refund for the class fee. Any canvas, threads, stretcher bars or supplies purchased for the class are not refundable. For studios and embellishment classes, student cancellations must be made at least 3 days prior to the class to receive store credit or transfer to another studio. Missed classes/studios are the responsibility of the student and will not be refunded or rescheduled.